The historic Davis-West House in Marianna is open to the public Saturday mornings from 9 to 12 noon, excepting the holiday weeks of Thanksgiving, Christmas and New Year¹s. Group tours of the house at other times may be arranged by calling Barbara Gregg at 850-482-3731. 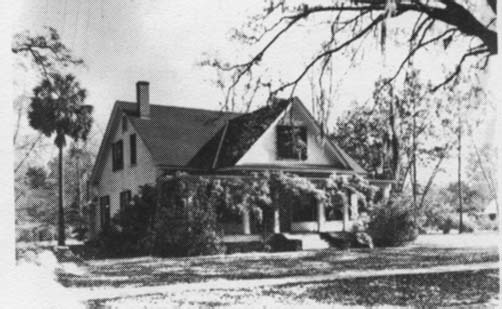 The house is located at the corner of Putnam and Madison Streets in Marianna. There is no admission charge except whatever contribution visitors want to make toward the upkeep of the site. Built during the 1840¹s by Jackson County pioneer John Davis, the house is listed in the National Register of Historic Places. It was bequeathed to the Chipola Historical Trust, Inc., by Slade West, who died in 1996 at the age of 92. He intended that it be used as a museum of regional history. The house contains the furnishings that belonged to Slade¹s parents, Confederate surgeon Dr. Theophilus West and Louise Slade West, including a room full of furnishings from St. Elmo plantation near Columbus, Ga., where Mrs. West spent her childhood. Other rooms contain Indian artifacts that Slade found in the Chipola River area when he was growing up and the many curios he brought home from a lifetime of traveling the world. An inveterate traveler and collector, he was a Merchant Marine officer who continued his worldwide journeys after retirement. Additionally, local historical items that have been donated to the Chipola Historical Trust are on display.